The moment happens, you find out your pregnant, and it is almost immediately that cravings begin to occur. Since you are pregnant you are eating for two, right? As much as we have heard this, and would love this to be the case, it is actually not completely true. During the first two trimesters, our body requires the same amount of energy from food as we normally consume in our non-pregnant state. The “Eating for Two” mindset is easy to embrace because it feels like a great excuse, until we have to pay the cost later. It is certainly one of the main causes for excessive weight gain in pregnancy, and adds to the challenging battle to lose the pregnancy weight because you are shedding a firm mindset as well as fat. Finding out you are pregnant usually starts with incredible excitement, followed by the first trimester exhaustion. Eating starts to become just something to do, and because we are going to gain weight anyways, why not enjoy it, right? For example, I remember my first; all I wanted was cheeseburgers and French fries. I literally could eat a triple cheeseburger a large fry and still want that again for the next meal. Looking back, I cringe, but that was my reality. Then with the subsequent pregnancies came pizza, Mexican food, and M&M’s by the Costco bag full. Yes, we will have cravings, and yes our taste buds will change – just like our sense of smell. We don’t have to completely deny those cravings, we just need to shed the lie of eating for two. So how can we still be healthy, and take care of our body and the baby growing inside us at the same time? When we eat too excessively and gain too much weight we are at risk for hypertension, gestational diabetes, and preeclampsia. None of this is to scare you, because you should enjoy life, especially your pregnancy. The reality is that pregnancy can be exhausting and sometimes a good junk food meal is a much needed pick me up, and a little oasis of happiness, right? But, just like when we are not pregnant, too much of a good thing is still too much, and our post-pregnancy self will thank us for not piling on excessive recovery time. So let’s look again at a basic truth – we need to eat. Eating is what will keep you and your baby healthy through these 40 weeks. But what can you do to stay healthy, and still enjoy this time? 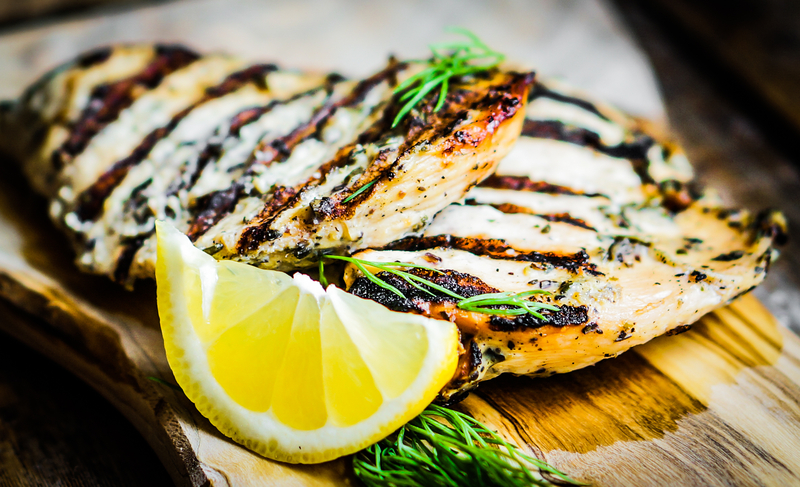 Eat healthy meals that are able to balance the tastes you crave with the fuel you need. Stay active – go for a walk if that is all you can do, but keep moving. Limit high fat and sugary foods. Please notice the word “limit”. It does not say “don’t eat…” or “stay away from…”. We all need a treat, and a plan that keeps mama bear away from a treat is a plan that will fail. In your third trimester, especially in the last few weeks of pregnancy, you need to prepare your body for labor. Much preparing is focused on the positions, and stretching, and getting your body physically ready for labor, and that is good. But did you know that before anyone runs a marathon, they eat for the race. This means that labor is just that – labor. It is work. Preparing your meals so that the food you are feeding yourself will give you the energy needed for this marathon. Eating foods that have good carbohydrates will help give you energy. Foods with good healthy fats and proteins will help you to not crash in the middle of the day and keep your energy levels up so that throughout the labor process you have a good amount of strength. Eat during this time to fuel your body. All of this info is a general guideline to help inform you. There is definitely a way to dial it in more specifically and develop a plan to accomplish for your pregnancy a good balance of joy and discipline. The big thing here is that you enjoy this special time and take care of yourself and that growing baby. To swaddle or not to swaddle is one of the many questions new parents face after their baby is born. The American Academy of Pediatrics (AAP) says that when done safely and correctly, swaddling can be a beneficial method to help soothe newborns and encourage sleep. The latest AAP guidelines for swaddling can be found here. This information is all good and helpful, but choosing what type of swaddle to use can be a feat in and of itself. There are so many options! 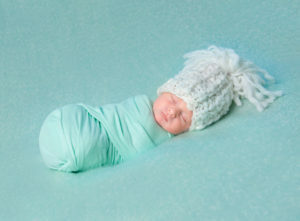 Do you use a simple blanket or purchase a pre-made swaddle? Do you wrap the arms or leave them free? How do you keep your Houdini baby from escaping? And what about when it’s time to transition out of a swaddle; then what? Over the years we’ve found ourselves using many types of swaddles & blankets with out clients. We’ve narrowed down the options to share our top 4 favorites in hopes of making the decision a little easier for you. If you are one that prefers using a good old fashion blanket instead of a premade swaddle, you should definitely give the muslim blankets from aden and anais a try. Their swaddle blankets are large, lightweight and perfect for swaddling your baby. They also are multifunctional and can be used to lay your baby on, shade the stroller on a sunny day or double as a cover up while breastfeeding. There are so many cute, stylish designs to choose from as well, so good luck with that! The Original Woombie especially, is a favorite of ours for its’ simplicity. Lay your baby in it, snap, zip it up and you’re done. I would even go as far as to say it’s almost impossible for your baby to wiggle their arms free while in the Woombie. Anyone who has ever gotten up repeatedly to re-swaddle their baby in the middle of the night will understand the awesomeness of this. The stretchy knit material allows plenty of room for your baby to naturally move around while also helping them feel snug and secure. 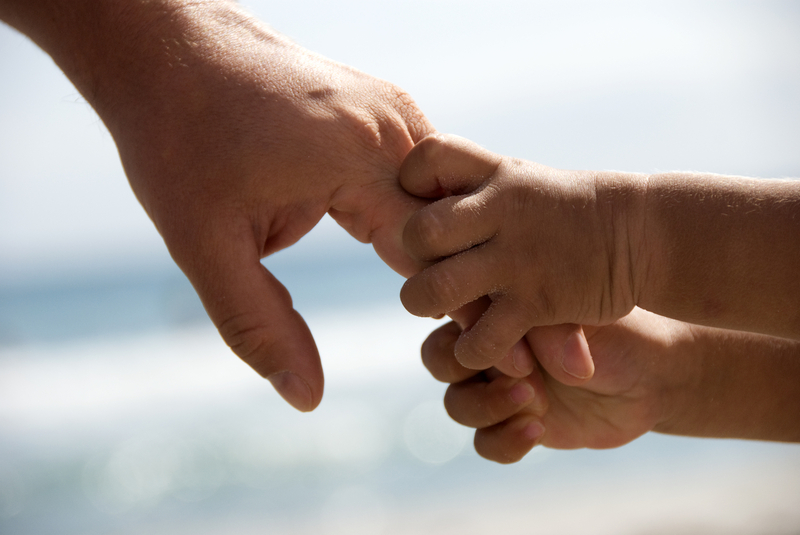 There are also several transitional options available depending on the individual needs of your baby. Whether you’re looking for something for your 2 week old, 2 month old or even 2 year old; Halo has swaddle and sleepsack options for every age. Their swaddles can be used with both arms secured or with 1 or both arms free. You also have the ability to keep the top part secure and simply undo the bottom half. This is especially helpful for the middle-of-the-night diaper changes when you want to keep your baby as drowsy and undisturbed as possible. The Merlin Magic Sleepsuit is specifically designed to use once your baby is ready to transition out of being swaddled; often around 3 months of age. This transitional suit helps your baby to still feel cozy while minimizing their startle reflex and twitching that happens during sleep that often wakes them up. The sleepsuit comes in 2 different sizes and is available in cotton and microfleece options. This transitional suit provides you the parent with an alternative to discontinuing swaddling cold turkey. Guest Post from Michelle B.
I was always skeptical of those women you see in the birth videos that say that they had an orgasmic birth or a pain free birth. I had a very difficult first birth, but I didn’t hate women who had an easy birth! I wanted to find out what I could do to improve the experience…I decided that I would not let my difficult first birth experience dictate my next birth. I set out on a journey to empower and educate myself on how I could have a calm, focused birth with our second. I contacted my doula to ask her advice on how to approach birth in a new way. She mentioned hypnobirth classes would be an excellent option for me. I looked up the benefits of hypnobirth and decided to enroll in classes after seeing all of these amazing benefits. I truly enjoyed the Hypnobirth classes, as they gave me time to relax, and connect with my baby. After the 5 week course concluded, I CONTINUED daily to do the relaxation exercises on the Rainbow Relaxation CD and my confidence built that a beautiful birth was within grasp. Hypnobirth allowed me to release any fear I had. The Marie Mongan Hypnobirth Method visualization exercises taught me to fully relax and embrace the birth process. I worked out at the gym around 10:30 pm then at 2:30 am I felt the strong waves (contractions) signaling my baby girl was making her way into the world. At 3:30 am I went to the kitchen to make my toddler’s lunch and lay out her school stuff. By 4:30 am I needed to head back to my bed room to relax and get in the zone to manage my contractions. It was intense, but by using the positions I had learned in class, and the relaxation exercises I had practiced daily, I was able to get focus on the pressure and NOT the pain. Thanks to my preparation I felt in control. By 6:00 am the baby’s head was out and I was calmly instructing my husband to get ready to catch. 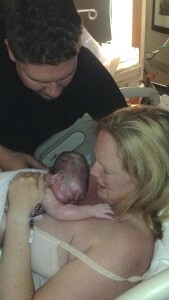 At 6:17 am our beautiful baby girl made her way into the world peacefully, calmly, easily without drugs or intervention. Best moment of my life, laying in my bed, in the dark, cuddling my new baby girl. I had a hard first birth, and I did not use Hypnobirth. I had a beautiful, peaceful second birth thanks to Hypnobirth, staying in much better physical shape and chiropractic adjustments. Hypnobirth can be effective for women to relax and embrace the bringing a child into the world. It enables you to have a peaceful state of mind throughout labor and deliver WHEREVER AND HOWEVER YOU CHOOSE TO DELIVER YOUR SWEET BABY. Guest Post from Cainna B. After my first son was born via c-section for breech presentation, I knew that I wanted to attempt a VBAC for any subsequent children. I got in touch with Bonnie on the morning of my positive pregnancy test (she was so wonderful during my first birth that I hurried to snap her up again at the first opportunity! ), and I asked her to suggest some VBAC midwives in our area. After meeting with a few and exploring our options, I realized that the hospitals near my home are not very VBAC-friendly, and that I might have to fight a bit of a battle to be successful there. 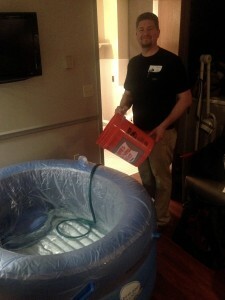 This ultimately led to our decision to plan a home birth with Abundant Life Birth Care, because one of my biggest priorities was to make sure everyone present would be completely supportive. I didn’t want skeptical nurses or overbearing doctors convincing me to be afraid. To be honest, I was a little nervous at first. The other women I know who have given birth at home were first time moms when they did it, but I had to consider the additional complexities associated with VBAC. My husband did not want to be anywhere near a hospital, so it was his enthusiasm that first steered my thoughts in the direction of home birth, and I did a lot of research (with Bonnie’s help) on the risks and benefits of VBAC at home. As the months went on, I began to develop such a wonderful relationship with my midwives; at some point I looked up and realized that any semblance of fear or doubt was gone from my mind. Just walking into the room with them made me feel at peace. My baby was growing, my body was healthy, and no one was treating me as “high risk” simply because I had a prior cesarean. I was excited to have this baby! But when my due date came around, he wasn’t quite ready to make an appearance. As the days went by, I began to worry that I might not get the home birth I had been looking forward to all this time. If I was still pregnant at 42 weeks, I would need the backup obstetrician’s approval to legally have a home birth, and what if he said no? I was willing to wait without intervening until my baby was ready, but I was frustrated and a little angry that an arbitrary legal timeline might rob me of the birth experience I wanted for myself and my child. Fortunately, my water broke in the middle of the night just 2 days shy of the 42 week deadline, and I felt all that anxiety melt away. 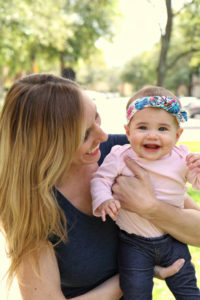 Because I never labored with my first baby, we were all prepared for a long, drawn out birth process this time, as is common for many first time moms. It was quite a surprise to us all when my contractions started right away and began intensifying quite quickly. Within a few hours, both Bonnie and Maya from Abundant Life were on their way to my home. They arrived around 7:00 am, and when Maya checked my dilation I was already past 7 cm. I believe the cervical check sent me into transition, and the next two hours brought some of the most intense pain I have ever experienced in my life. While Maya was busy caring for my health and the baby’s, as well as setting up her medical equipment, I had Bonnie’s undivided attention and emotional support to get me through the worst contractions. I don’t believe anything can truly prepare a woman for the experience of childbirth, but I knew that my body had been designed for this and had just decided to let the labor happen without trying to control anything. I also had the double blessing of Bonnie and Maya calmly reassuring me that everything was happening normally, and that the pain and contractions were good, bringing the baby’s head down a little more each time. I labored in my bedroom until his head was almost visible, and then Bonnie helped me into the birth pool so I could push. Until that moment, I wasn’t sure if I wanted to actually give birth in the pool, but the feeling of relief once my body hit the water convinced me that it was the best choice. My son was born into the water at 9:05 am, after 5 hours of labor and 20 minutes of pushing. He spent a few minutes on my chest, and then we got out of the pool so I could deliver the placenta and clean up a bit before snuggling into bed with him to rest and nurse. Everything felt so natural and so calm, and although I was in pain, I was never afraid. I gave birth while surrounded only by people who believed in me and believed that my body was not broken. I also loved recovering in my own home, without nurses taking my blood pressure at 3:00 am or waking me up because I had fallen asleep with the baby in my arms. I feel so blessed to have two beautiful and healthy children, as well as the unwavering support of my family and my birth team. God has given us so much, and I sincerely wish the same joy and happiness to every mother and her family. Thank you for giving me the opportunity to share my story! Guest Post from Jessica C.
She was only two days late but I remember feeling like she was never going to come. I realize the impossibility of that statement and I realized it then but still. I went into labor around 4:30am on Friday January 17th. I downloaded an app to track my contractions and they were getting progressively stronger so I knew Mae was on her way. I let Dave sleep as long as he could before telling him what was happening since I knew he was in for a long day! I was already scheduled for my weekly exam that morning so I called, told them I was having contractions so they said to come on in. We grabbed our hospital bag (just in case) and the yoga ball and away we went. When they checked me at 9am, I was about 3.5cm dilated and my contractions were about five minutes apart. The doc said I could choose to go home or go to the hospital. Home was about twenty minutes away and the hospital was about two so I picked the hospital. Our original plan was to labor at home as long as possible but twenty minutes home to labor more then need to drive twenty back didn’t sound like a good plan. Within the 15 minutes it took us to get to the hospital, get hooked up to a monitor and get checked I went from 3.5 to 5cm and the contractions were beginning to pick up steam. At the time, I was glad because I’d heard stories of people being sent home if they weren’t in active labor. Again, home and back was not something I wanted to do. I was also relieved that they had a room open as it was a full moon the night before and their 12 rooms have been known to fill up fast! Since leaving the dr’s office I’d been keeping my doula, Bonnie, posted on how things were going. Thankfully she arrived just as the contractions became more painful. Around noon, I was admitted to Room 5. Bonnie, Dave and I got to work. Since I had chosen not to receive any interventions (pitocin, pain meds, epidural etc…) it was actually very quiet and peaceful in our room. I did have a short visit from my mom and dad but I was quick to kick them out because I needed to stay focused and visitors made that difficult. I spent the next couple of hours on the yoga ball with Bonnie and Dave massaging, coaching and just providing the encouragement I needed. As things progressed, I moved into the hospital bed where I just rocked back and forth for what seemed like an eternity. I do not know how I would have ever made it through that day without Dave’s support and Bonnie’s gentle affirmations. I remember watching the sky outside change colors as the contractions became more intense. I could tell by the light that it must have been around 5:30. At about 6pm and 7cm, things were getting very uncomfortable so when the doctor stopped in I asked him how much longer he thought we had left. His guess was five hours. After laboring 13 hours, I knew I did not have 5 left in me. Thankfully he was wrong and I was right. I started feeling very nauseous (in addition to the labor pains) and truly felt like I couldn’t do it anymore. I told Bonnie and Dave that if I wasn’t ready to push soon I wanted the epidural. I think they probably laughed. I was 8.5cm dilated by that point. So the epidural was out of the question. It wasn’t long after that when the nurses changed shifts and things started moving pretty fast. I had an incredible nurse named Jade who I will never forget. She got there around 7pm and I told her I had to start pushing or else (not sure what my alternate plan was). She informed me I was at 9.5cm, did a little magic, called it 10 and we started pushing. The rest is unfortunately really fuzzy but I do remember the dr showing up about half way through, the nurses telling me to reach down and feel Mae’s head, holding my breath, pushing with everything I had in me and feeling her wiggle out. It was 8:11pm and Mae arrived weighing 7 pounds and eleven ounces and measuring 19 inches long. I must’ve gone into some sort of shock after that because the next thing I can remember is seeing her dressed, somewhat cleaned up and glossy eyed from the ointment they used. Thankfully, Dave was by my side the entire time so he was able to cut the cord, get some video and have full recollection of those first few moments. My initial plan was to hold off on family visiting until after Mae’s first feeding but we didn’t manage to do that right away so we let them come on in. My dear friend Kat was there to document those first moments. In hindsight, I wish I’d had her there sooner for Mae’s birth since I don’t have any memory of my first 15 minutes with her. I’ll probably regret that forever. On the topic of regret, another huge one I have is having so many visitors the next day. I think 16 people came and some stayed most of the day. This is in addition to the doctors, nurses, the hearing test lady, social security rep, pediatrician, lactation consultant, hospital photographer and lab tech. It was very overwhelming and I don’t think I got to spend any time with Mae in my arms until almost 3pm. I still get pretty emotional every time I think about it. If I had it to do all over again, I would only allow two visitors at a time in short blocks. It was just too much. The next morning we made sure it was just the three of us. It was sweet but short as they discharged us fairly early. I remember holding her and crying heavy tears as we left Room 5. I was forever changed in that room. I have never been more grateful and humbled by anything in my life and I’ve continued to feel the weight of that every day since. 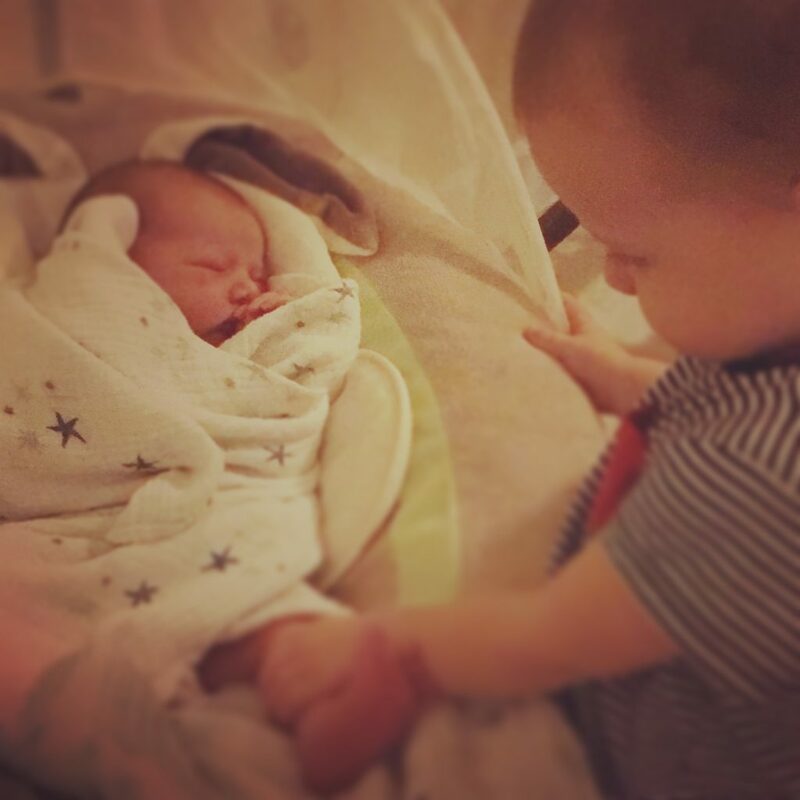 Guest Post from Jennifer R.
About 1:30am on Friday, December 12th I woke up and knew I was in labor. I had previously had contractions that seemed like labor, but this was different. I was feeling pain in my back in addition to my abdomen, and I was spotting. I got out of bed because I was uncomfortable. I came out to the living room to try to sleep on the couch, as I often did in pregnancy. I decided I should let my husband Jared sleep as long as possible, since it would likely be a long process. The contractions weren’t too intense yet. I woke Jared up around 5:30am. By that point, the pain in my back during contractions was getting stronger. They were about ten minutes apart. For most of the morning, Jared and I did things around the house. We made breakfast, tidied things up, did laundry. I was answering work emails and trying to finish up a project. We still had some returns to make to Amazon. I started printing shipping labels and Jared boxed up the items. By this point, I needed counter pressure on my back during contractions. Around the middle of the day, contractions went from being ten minutes apart to five minutes apart within the hour. They were much stronger, more intense and closer together. I had been texting our doula, Bonnie, throughout the morning so that she was aware that I would be going into labor imminently. Around 1pm my friend Kayla offered to come over and be with me. Jared liked the sound of that – it’d give him a break! I thought it’d be good too, because she could distract me. We talked about different labor positions; I remember sitting on the labor ball while we talked. By approximately 3pm, contractions were much closer together, two to three minutes apart. I began to panic, thinking we waited too long to leave for the hospital. I texted Bonnie to come now! Jared and I were in the bathroom alone while Kayla was fixing me something to eat when I got really emotional. I was thinking about labor became very fearful. I started to cry. Jared held me. I said over and over, “I’m so scared. I’m so scared.” I went and laid down on the couch while Jared and Kayla prayed over me and read Scripture over me, still crying occasionally, until Bonnie arrived. We left for the hospital almost immediately. Jared had put together this genius contraption – a tube sock full of tennis balls, to help when his hands got tired from applying pressure to my back. Well, this thing also worked fantastically in the car to help me get through contractions. I had it wedged between my back and the seat. I would roll up and down when contractions hit. Picture a bear scratching his back against a tree. That’s basically how it worked! Jared pulled up to valet the car at Good Sam just before 5pm. Bonnie met me at the car where I had a contraction. We then headed up into the lobby, where I had another contraction, and another in the elevator and another in the hallway of Labor & Delivery. It was the contraction in the hallway, in full view of the nurses’ station, which made them decide that I did not need to go to triage. They needed to get me into a room, since clearly, I was in labor. While Bonnie helped me up to L&D, Jared filled out all the paperwork in Admitting. In the delivery room, I was hooked up to a fetal monitor while sitting on a labor ball. That was a pretty comfortable position. When they checked me I was 4-5 cm dialated and 90% effaced with contractions every two minutes. Bonnie and I talked while we waited for the water tub to be set up. Jared helped the folks from Orchid’s Nest get it ready. Without him it would have taken them much longer, and I was anxious to get in! Once in the water, labor felt different. It didn’t completely alleviate pain but it was a welcome distraction. I moved around to try different positions but wound up mostly leaned forward, resting my arms on the rim of the tub. I labored like this for a while. Bonnie kept a washcloth with essential oils close to my head so I could smell the oils and enjoy the calming effect. She also rubbed warming gel on my tailbone – probably of the most amazing pain relief techniques – I loved it! Jared and I would pop kiss a lot during labor since we knew that kissing releases oxytocin, a hormone that would help me manage pain. After a while in the tub I got out so they could check me. I was nine and a half centimeters and my water still had not broken. I had initially wanted everything to happen spontaneously, but at this point, I just wanted labor to move along! I requested that the doctor come quickly to break my water. Dr. Lazo came in to break my water and watched me labor for a while after that. I began to feel the need to push even though I wasn’t ten centimeters yet. I wanted to labor standing up. I had seen a video from Ina May Gaskin about a particular position and wanted to try it. I draped my arms around Jared’s neck and every time I had a contraction I dropped my body weight. The poor man! Of course, contractions were very close together now so he was holding me like a dead weight every two minutes. Bonnie continued applying counter pressure to my back and hips. After about an hour or more of laboring like this we decided to try laboring on the toilet at Dr. Lazo’s suggestion. I sat facing the back of the toilet, with my arms resting on the basin. I pushed like this for about an hour, with Bonnie encouraging me the whole time. I was beginning to get tired. Jared said that Dr. Lazo just watched the whole scene in a curious manner, with a “we’ll see how this goes” attitude. It’s not every day that their practice sees a woman attempt to birth naturally. It’s more of a rarity. We labored the final stretch in the bed with the back in a sitting position. By this point, I had been in labor for nearly twenty four hours and was getting fatigued. The team had to really encourage me. Our nurse, Annie, was amazing. She was very supportive of natural birth. She and Bonnie and Dr. Lazo all kept telling me how good I was doing and cheering me on through each contraction. They brought a mirror out so I could see Lincoln’s head. They actually had me feel his hair, he was right there! I think feeling the top of his head helped me keep going as I was beyond exhausted and longing to sleep. At one push I finally felt his head move past the lip. It was almost like it locked into place and I could hear it move past the bone. It did increase the pressure but I was mostly relieved that this would soon be over! The doctor, nurses and Bonnie all were really excited and were exclaiming that just one more push and he would be here! Sure enough, I pushed one more time and he came! What a glorious moment! Labor was over! He began to cry loudly. I was overwhelmed and overjoyed. Jared and I looked at each other and stared at him in wonder. What an amazing sight! Our son! He continued to cry. I joked he sounded like a little t-rex, “Raaaar! Raaaar!” Only later did I notice that he had a wound on the back of his head that scabbed over. That may have been one reason he cried so long. Jared cut the cord after it stopped pulsing. Annie told me a few seconds after delivering, “Jen, you’re hemorrhaging. We have to stop the bleeding.” She stuck pitocin in my arm. I didn’t mind, now that Lincoln was here, they could give me whatever medicines were needed. Bonnie stayed for a few hours after he was born. Around 3am I told her to go home! I held him for a long time on my chest, skin to skin. Jared had to ask me if he could hold him. Of course, I said yes! Then Jared held him skin to skin. I kept him on my chest all night, much to the consternation of the baby’s nurse. She told me it would be best to let him sleep in the bassinet. I told her it would be best for him to sleep with me, and if the hospital policy had issue with that, she could bring me a waiver of liability and I’d sign it. That was the last I heard about the bassinet. We snuggled and nursed until morning. There’s a board book called “On the Night You Were Born”. The first time I read it, my eyes welled up with tears. “Never before in story or rhyme (not even once upon a time) has there ever been anyone like you, my friend. And there never will be, not ever again. Heaven blew every trumpet and played every horn on the wonderful, marvelous night you were born.” Words never rang so true.